Here is a predictions and statistics report I did up for Entrepreneurs fundraising in 2012. Most of the information came from the National Venture Capital Association; although I pulled up alot from our other half….the investors. Seed stage startup investing has nearly been cut in half over the past year, 48% to be exact according to the National Venture Capital Association. Where did it go? Well, to early stage investing of course. Early stage investing rose 47% the past year. Can we expect to see similar trends and statistics for entrepreneurs fundraising in 2012? It’s very likely. And the Tech Fundraising Bubble? Mark Suster has been claiming we are in a bubble. This is not apparent to most of us; however, it may be apparent to someone who sees activity in large volumes. A few other investors have made predictions as well stating…they don’t believe we are currently in a bubble. But yes, we are getting ready to see a dramatic shift. It’s also notable, many firms see a bubble getting much worse. VC’s and tech incubators that invest in seed stage tech companies, are investing more than they are raising themselves. 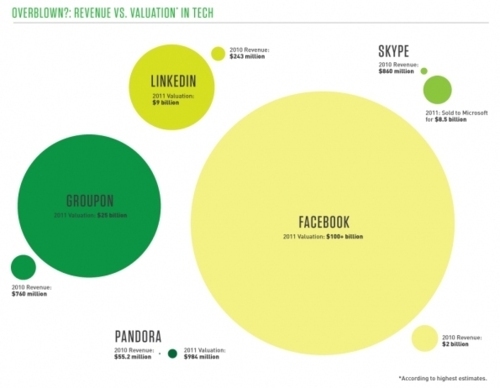 Valuations are extreme compared to the amount of revenue these companies are actually generating. This graph represents this, the teeny tiny dots are revenue. The big dots are valuations….do you see a bubble? What Industries Are Investors Shifting To When It Comes to Fundraising? A new industry not previously receiving as much fame is leading the shift now: Advertising, Marketing, Digital Media, and Content. While enterprise software still remains a big industry to invest in, a new shift is also occurring in enterprise software toward content platforms. So while the “startup” hype has just begun, it’s likely not here to stay (the term “startup”, although sometimes used by entrepreneurs of all industries, really refers to high growth tech companies”). Entrepreneurship will continue to bloom as trends predict, but it will come in the form of many different types of entrepreneurs, founders, industries, and companies. *I guess I should mention here also, I’m completely unbiased. Until we get an in-house editor to handle regular guest posts, you’re stuck with me 😉 so I have to offer many different view points.